This entry was posted in Just Life on December 20, 2014 by Steve Tilford. That is my new term for maple syrup. The stuff has gotten so expensive, it’s nearly $100 a gallon now. Can you believe that gas is under $2.00 a gallon and maple syrup can cost 50 times as much? Crazy. I use a fair amount of maple syrup. Only the real stuff. I pretty much can’t stomach imitation maple syrup. I’m kind of a food snob in that respect. Plus, I don’t think that the fake stuff is very good for you compared to real maple syrup. I remember when grade B maple syrup was less than $5 a quart at Trader Joes. I like grade B, the darker, richer tasting syrup. I think it is around $15 now, but I’m not sure about that. And it isn’t even a quart, it’s 750 ml I think. I’ve never actually been to a maple syrup farm. The closest I came was at Tour of Battenkill. I was trying to figure out the course, a couple days before the race, and asked a woman working the race about a few turns. She told me that they had a complaint from only one guy the year before, the man that owns the maple syrup place on one of the first climbs. She said he was a grouchy old man. Catherine was with me that year and we went out to ride the course. We rode by the maple syrup farms, with all the trees connected with tubing. It was amazing. A mile or so later, we came to an intersection that I wasn’t sure which way to turn. So we stopped and looked at the course map. A man in an older American car pulls up and asks us if we needed some help. I tell him we’re just trying to figure out the race course. He says that we need to turn at the corner. He then says that he owes the maple syrup farm a couple miles back and introduces himself. He’s the guy that complained the year before. But, he’s done a complete flip, because he is so nice and says how he loves the bicycle race coming by his land. He invites us over to have some maple syrup ice cream, on him. We tell him we need to ride, but would like to come back. He says anytime. We never made it back. A regret. Bill told me that they have a new method of extracting sap from the Maple tree by topping the tree and putting a suction on the cut area and pulling the sap out. I think he said they are getting 10X as much sap as just tapping the tree. I think they produce 4 times as much maple syrup in Canada as here in the US. SInce the Canadian dollar has plummeted to .85 of the USD, maybe it’s more affordable there? I’d make a trip in my van to hoard a few cases. I’m planning on going out to race Battenkill again this year. I like that race and everything about it. For sure I won’t make the mistake of skipping the maple ice cream. I hate regrets. 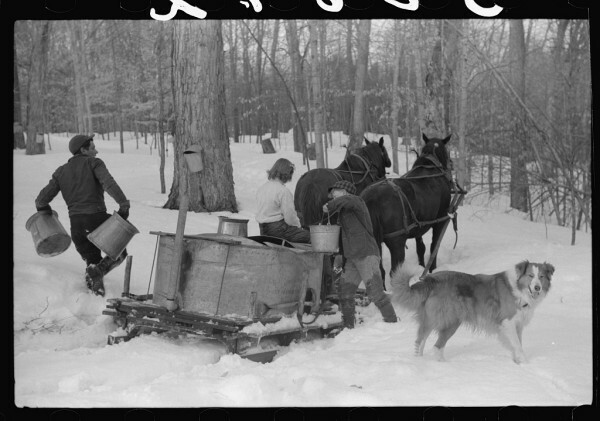 If you want to learn more about maple syrup, here’s a pretty good article. It’s not like we’re collecting it like this anymore and boiling it over open fires in cauldrons. My dad made maple syrup on our UP of Michigan farm back in the 50’s out of an actual log cabin. Story was he got out because there was no money to be made. Ted king is working w untapped to make maple syrup to go. When I was 4 years old and lived in rural Quebec I rode on the horses pulling the same set up….. The sugar shanty where it was …boiled down?… Was incredible!!!!! Our family friends from there still send a gallon or two at Christmas time every year …..for the last 48 years….. Good people. Probably for the same childhood reason my favorite apples are Macintosh. 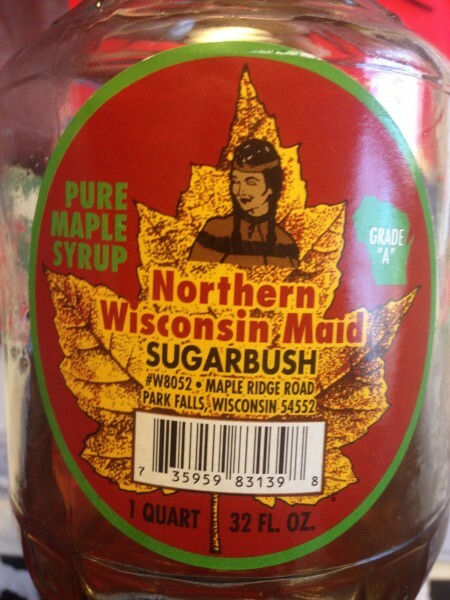 Not to start a negative thread here but I’ve heard climate change has been affecting the sugar maple industry in the us and creeping north, may be related to the price increase. The transition from winter to spring weather is key to maple syrup production. Sap production is maximized during daily freeze/thaw cycles (below freezing at night and above freezing during the day). If the winter to spring transition is short, then less sap means higher prices for the year. Also, “low” grade maple syrup has the best flavor. Because the sugar content is lower in “low” grade sap, more boiling is required to produce the syrup which intensifies the maple flavor. 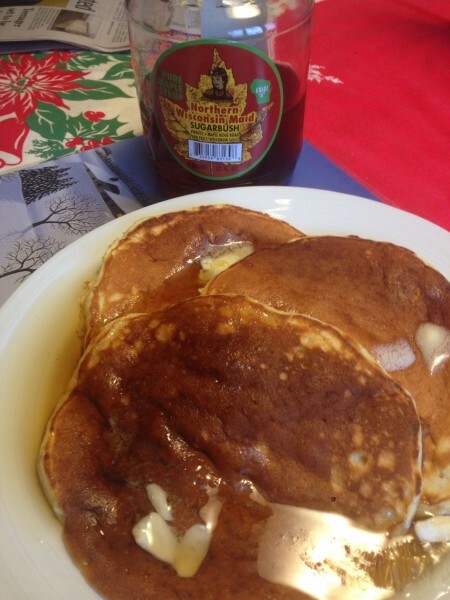 Always go for the “low” grade maple syrup! You can get id direct from Vermont shipped to your house for half the price (with shipping included). Made in small batches – not commercially made. I am including the link below. I got maple syrup plus some pedals for winning a road race in Vermont – the Tour of the Valleys – in the 1980s. Pretty cool product prize. does anyone know if local maple syrup has the same benefits as local honey for allergy issues? Probably not because, I think, the allergy combating properties of honey are because of the pollen contained in the honey. Since maple syrup does not contain pollen it will not have these same properties as honey. If you stop in the Twin Cities let me know I can get it cheaper (e.g., no shipping). Ok, after reading this a couple days ago I bought some at the store to try. I don’t like it. 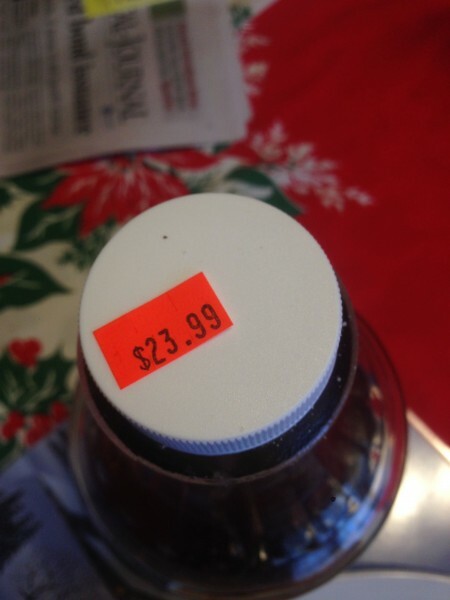 I like the cheap stuff better. My favorite is the Great Value brand from Wal-Mart. I’ll also be up in the Cable area over Christmas. Let me know and I bring some over.